Those searching for unmistakable evidence of the global climate crisis should pay a visit to the Arctic. The Arctic is warming twice as fast as the rest of the world. The average annual temperature in Barrow, at the northern-most tip of Alaska, has increased 4.5 degrees Fahrenheit in the last 50 years. Almost every week Alaskans see a news story about the impacts this rapid warming is having right here at home: coastal villages being forced to relocate because of accelerated erosion caused by climate change; Arctic ice cellars in the permafrost melting and causing the loss of stored food; violent fall storms threatening people and animals; walrus and polar bears coming ashore in greater and greater numbers because their sea-ice habitat is melting beneath them. 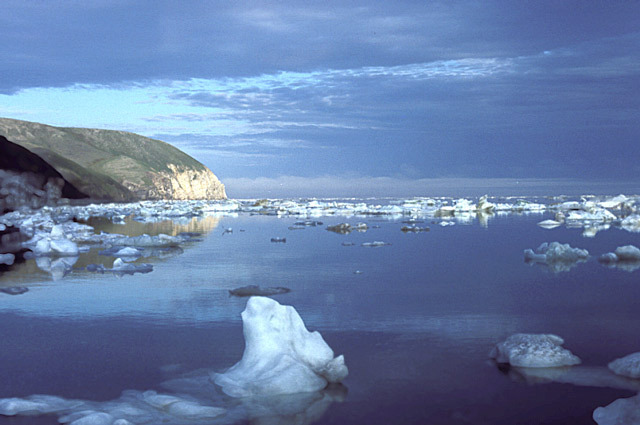 Arctic sea ice is one of the most endangered ecosystems on earth. 2007 was the lowest summer sea-ice year on record, and 2008, 2009 and 2010 followed close behind. Arctic species such as polar bears and walrus cannot survive without Arctic sea ice. There are documented accounts of polar bears drowning as they try to swim between land and distant sea ice, and of starving polar bears resorting to cannibalism. In the fall of 2010, as many as 20,000 walrus—an unprecedented number—congregated on the shores of Arctic Alaska because there was no suitable sea ice. Walrus that are forced onto land in such large numbers are vulnerable to disease, predation and stampedes that lead to trampling deaths. The drastic loss of sea ice has led the U.S. government to list polar bears as a threatened species under the Endangered Species Act and to designate 187,000 square miles of polar bear “critical habitat” in Arctic sea ice and coastal areas. The U.S. has also proposed listing two ice-dependent seal species under the Endangered Species Act because of the loss of their sea-ice habitat, and we are expecting a decision this month about federal protections for the Pacific walrus. The climate crisis is upon us, and it will only get worse. Scientists tell us that to avoid catastrophic tipping points, we must bring atmospheric carbon levels down to 350 parts per million. The only way we can do that is by breaking our addiction to fossil fuels and converting to clean, renewable sources of energy. In the meantime, in order to preserve Arctic sea-ice-dependent species, we must not allow oil drilling in the Arctic, and we must carefully limit and monitor shipping through this fragile Arctic habitat. If we take concrete steps now to protect polar bears, walrus, and other Arctic creatures, and to save their disappearing sea-ice habitat, the benefits will accrue not just to the polar bears and walrus, but to all living things in the Arctic, and to all living things on Earth. My comment is: I have been interested in climate change and its results for approximately 12 years. I have studied the attitudes of the media and politicians over this period and have not seen anything to mindfully ignorant about the problem. I am now writing up the results of my research. I hope, seriously the world can see an increase of understanding by all the policy makers of ‘WHAT SHOULD WE DO”. Thanks to the scientists who spend a lot a time working on this problem.